Penn Manor — seeded No. 3 in the Class AAAA bracket — scored its lone run in the bottom of the second inning. One run was hard to come by during Tuesday’s District 3 Class AAAA semifinals game between Dallastown and Penn Manor, but when the Comets found a way to get one in the second inning it proved costly for the Wildcats. The two clubs combined for just six hits through seven innings, as the Comets ousted Dallastown 1-0 at York College. Wildcats' starting pitcher Jaelynn Harbold had a strong performance, striking out three and working out of several tough spots later in the game. But it was a walk to open the bottom of the second inning that set the Comets scoring in motion. Morgan Yingling dropped down a bunt to move courtesy runner Victoria Malpica to second and then Malpica stole third on a dropped ball by the catcher. Addy Long grounded out on her next at-bat, but she managed to drive in a run in the process. 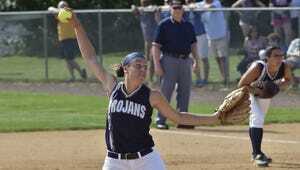 “In girls’ fast pitch the runs are hard to come by,” Penn Manor coach David Stokes said. “Dallastown…is a very good team. They’re a very well coached team and they certainly did not make any mistakes themselves out there. Harbold and Comets’ starting pitcher Brittany Hook kept the base paths clear for most of the game after that. Hook worked herself out of the top of the third after giving up a base hit and walking a batter. In the bottom half of the inning it was Harbold’s turn to work out of a jam with a runner on third. In the fifth the Wildcats’ ace had a runner in scoring position with only one out. Harbold struck out the next two batters to retire the side. Tuesday’s semifinals win sends the Comets to their first district championship game in program history. It was also a way to erase some of the ghosts of last season, when Penn Manor was eliminated from the district tournament in a semifinals loss to Lower Dauphin at York College. Dallastown has already locked up a spot in the state tournament, but they will play a District 3 third place game on Thursday against the loser of Chambersburg vs. Lower Dauphin. That game will help decide seeding for the state tournament, which starts on Monday.